Malvern College Hong Kong is located in close proximity to the Hong Kong Science Park, the Chinese University of Hong Kong and the Education University of Hong Kong. Adjacent to the scenic Tolo Harbour, our seven-storey state-of-the-art campus is designed specifically with Malvern College’s culture, ethos and philosophy in mind. Our 26,000 square-metre campus houses the primary and secondary school including academic, sporting and recreational spaces, incorporating the latest innovation and technology in teaching, learning and environmental sustainability. The College’s low-carbon footprint campus is designed according to environmental design principles that enhance natural ventilation, light penetration, and shading. The landscaping across floors has been consciously designed to match the adjoining green environment. An open-plan library is located in the heart of the school and serves as a common learning space. Physical boundaries are minimised to create a welcoming environment and encourage collaboration. Blended learning is the combination of face-to-face instruction with online learning, recognised as the most effective method of achieving a rewarding personalised learning experience. Malvern College Hong Kong champions blended learning with well-equipped learning spaces, makerspaces, and other modern purpose-built facilities, and the use of effective learning technologies. All classrooms in Malvern College Hong Kong are equipped with interactive projectors, audio systems, and acoustic ceilings. Professional standard laboratory furniture and equipment, with 4-sided fume cupboards, ensure an optimal learning environment for scientists. The layout of laboratories facilitate tutorials and practicals. The main reception lobby of the campus, the Gallery, serves as an exhibition area for pupils’ work. 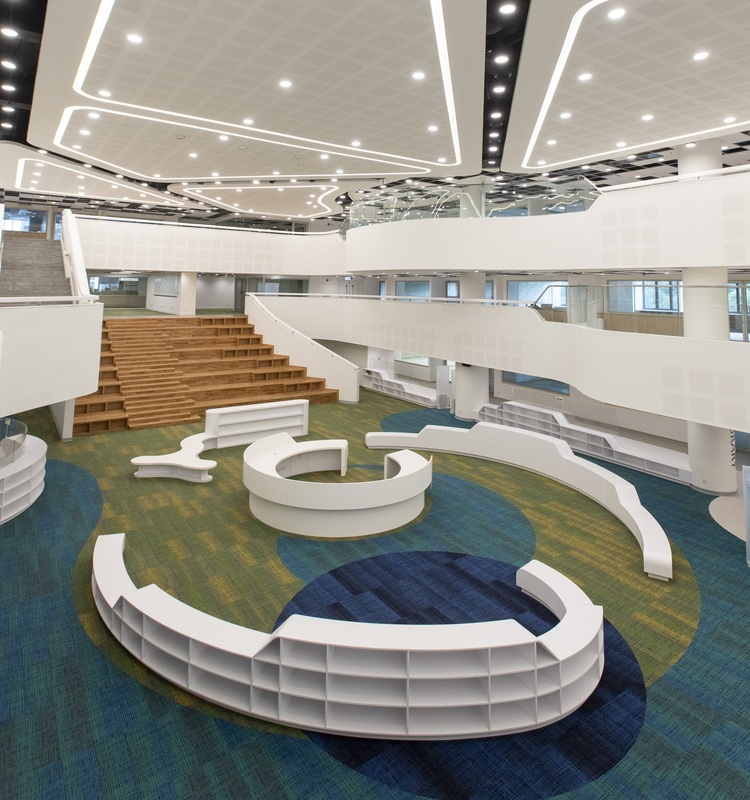 An open-plan library located in the heart of the school and serves as a common learning space. Physical boundaries are minimised to create a welcoming environment and encourage collaboration. As sports are an important and integral part of our curriculum, all our pupils will participate in a selection of sports including rugby, cricket, netball, basketball, rounders, athletics and gymnastics. While many of our sports are taught on campus some will require off campus access to specialist facilities. Other planned sports will also include sailing, kayaking, cycling. Some of these sports are offered as co-curricular activities after school. On campus, Malvern College Hong Kong has an AstroTurf Skypitch that is equipped with 4th generation artificial turf and shock-absorption pad, designed for football and rugby. The design ensures that uniform lighting levels reduce any disturbance to our neighbours. The landscaped garden and outdoor space provides pupils with experience of planting and gardening. Inside on the ground floor we have a 6-lane, 25m heated swimming pool offering swimmers an excellent all-year round facility. The indoor multi-purpose sports hall provides full-sized basketball, badminton and volleyball courts, whilst cricket lanes are featured with special flooring that closely mimics the bounce of a real cricket pitch. It can also be used as an assembly hall for school events. The multi-purpose design makes it a versatile space for the whole Malvern College Hong Kong community. A 450-seat auditorium (“Big School”) with concert hall-quality acoustics are geared towards musical and orchestral performances. Furthermore, there are also various music rooms, band rooms, and individual practice rooms that are designed to enable good mixing of the sound for a group while reducing noise build-up, so that musicians can hear themselves and each other clearly. The dining hall (“the Grub”) is equipped with a professional kitchen and is designed so that we can deliver the Malvern College House Dining experience. Flexible seating and furniture allows the space to be used for different House Events.